Congratulations! You are pregnant (well maybe you aren’t but you might know someone that is). Pregnancy means a lot of changes are coming for both you and your dog. For many people, up until they have a baby, their pets have been considered their children. Most people think that not much will change once baby has arrived, and that the pets will adapt and all will live harmoniously. Truth be told, many pets, get relegated to outside, and are no longer a priority for their owners. Babies take up a lot of time. They poop, pee, eat and sleep – in a continuous cycle. With the odd scream or cry (or maybe not so odd) thrown in. It takes several hours out of your usual day just to change, feed, comfort and soothe your baby, and then when they are finally sleeping, you are rushing around cleaning, washing, folding etc. Little time is left over for a family dog that isn’t already prepared for the changes ahead. So what can you do to set you and your pooch up for success? ​Be sure that you are able to read and most importantly listen to your dog. Remove them from the situation before they have to resort to growling or snaps. Remember never to punish a growl - it is a communication tool. Make sure these are reliable, both in and outside of the house and when different people use them. Remember to be consistent in your requirements. If you are carrying baby, you may not be able to point or direct your pooch, however if they have a reliable cue on both verbal and hand signal, you can simply ask them to do what you want. As a safety exercise, both during the latter stages of pregnancy and when you have baby, teach your dog to go down the stairs to a mat, or up the stairs to a mat in front of you – that way they are already out of the way before you tackle the stairs yourself. This exercise is also especially helpful when elderly relatives may be visiting etc. 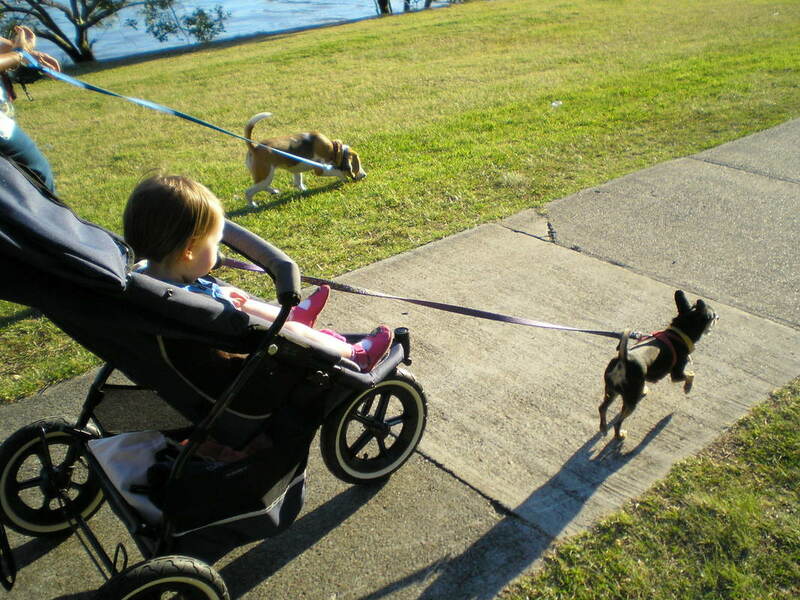 If you plan on walking baby in the pram with your pooch, you need to ensure that A. your dog is able to walk on a loose lead, and B. your dog is able to walk on a loose lead beside a pram. You know that doll I was just talking about? Guess what, there is a reason to have it. Wrap the doll in a baby blanket (as you would a real bub – see, setting you up for success too). Leave a small amount dangling. Carry the baby doll around, talking to it and paying it attention. Use the pram, the cot etc as you would for a real bub. Reward your dog for keeping 4 paws on the floor. If your dog is bouncing at the doll, you know you have some skills that your dog and you need to work on. Do you plan on your baby having some time on the floor? – Tummy time for babies is important. Most parents choose to use a particular blanket for this. It is important to teach your dog that this is not their blanket, and they should walk around and not step on it. Get out the fake baby, and pop it on the blanket. Lay on the blanket with it and reward your dog for staying off. If your dog needs to walk around it, use a lure to guide them and reward for no paws on the blanket. Often our dogs that don’t have children brother or sisters have toys scattered from one end of the house to the other (much like your child will do in time). Your dog’s toys should be placed in a toy box – and picked up and put away (probably not by them) when they are finished. Your baby should have another toy box, and likewise, these toys should be picked up and put away after use (probably not by them). Dogs may find it difficult to distinguish the difference between their toys and the baby’s. Both baby and dog toys often have squeakers, rattles, soft textures, rubber textures and balls. A trick to help your dog distinguish theirs from the baby’s is to rub a fragrance onto their toys (not the baby’s). A fragrance you could consider is that of a fresh herb from the garden such as mint or thyme. You do not need to smother the toy in it – remember dogs have an ability to smell that is 50 times greater than ours. Hounds have over three hundred million sensory receptor sites, compared with a humans mere six million. Once you have picked your baby’s new room – your dog should be given limited/restricted access to this area unless under direct supervision. Baby gates are brilliant for this. How have your dog/s traveled in the car up until now? Did you know that drivers caught with unrestrained pets risk fines of $400 or more, and the loss of 3 demerit points. If an animal is injured as a result of being unrestrained, owners may also face up to 12 months in jail or a fine of up to $30 000 under the Animal Care and Protection Act 2001. Your dog/s should not have access to the baby when in the car. This may mean that they are seat belted securely beside the baby but out of reach, or in the rear of hatch/wagon/SUV type vehicle. Crating in the car is another option – again the crate must be safely secured. Practice taking your dog out in the car, with the baby seat installed. You may be considering changing the house rules for your dog once the baby arrives. Think ahead, and do it before hand. That will be one less stress for your dog and yourself to endure once baby arrives. Remember, for something to work, everyone in the household needs to be on the same page and consistent rules need to be followed. If this isn’t the case, it will just result in confusion, conflict and frustration for everyone involved. So what rules to consider? Is your dog allowed inside? Everywhere? Don’t boot your dog outside once baby arrives. If your dog is going to have to learn new rules, start the process now, and set them up to enjoy the new outside time by using enrichment food toys, having your morning coffee/tea with them outside, throwing the ball etc. If your dog is going to be allowed to stay inside, make sure that the baby’s room is only accessed under supervision, and practice keeping them out of the kitchen etc when cooking and dining room when eating. Use a kong and a crate to manage dinner time for both you and your dog. Is your dog allowed on the bed/lounge etc? I have no problems with dogs having access to beds and lounges if that is something that you wish. However, they should be able to be asked to hop off or go to their mat without growling, snarling etc. If this isn’t the case, then there should be a no dog on the couch/bed rule. Do you have more than one dog? Do they play inside? From now on, encourage your dogs to play outside. Raucous play inside, could result in an accidental trampling of the new baby. If play begins inside, interrupt them and send them outside and encourage them to play again. Does your dog have good Door Manners? You need to teach your dog not to rush out the door without being released using a cue word. It doesn’t matter if your dog does exit the building before you, what matters is that it was under your control. Alternatively, establish a good sit, wait on your mat, you step through the doorway and call them out if you wish. Otherwise, give them a “free” cue and allow them to go about their business. This is not about establishing “dominance” over your dog – that is an old fallacy – it is about safety and successful management. Does your dog have Kitchen Manners? Establish a no beg, nudge, paw for food rule. If you have already rewarded for this, start ignoring the behaviour and rewarding your dog when they are doing something you would prefer. Expect an extinction burst – this is where the behaviour that was previously rewarded, temporarily gets worse, and then goes away. If the behaviour is getting worse, you are on the right track and just need to work your way through the extinction burst. Use a Mat or Crate for dinner time (both yours and theirs). Ask for handout #11. Crate Training. Babies make some unusual sounds. These sounds may frighten some dogs, or create interest in others. Attempt to desensitise your dog to these sounds by playing them (use a CD, iTunes, App or other) and play these sounds at a level your dog can hear but is not overly reacting to. Reward for the calm behaviour. Play these sounds in the room the baby will be in, the baby’s pram etc. React calmly to the sounds yourself, and go to the sound, pick up the item playing the sound (hope you didn’t choose a big surround sound stereo) and comfort it as you would a baby. I really hope you closed the curtains before your neighbour sees you). An app that you could consider available for both apple and android is “sound proof puppy”. There is also a great book that comes with a CD called “Tell your Dog You’re Pregnant” by Dr Lewis Kirkham. Or, you could download an album from iTunes – an example one I found was Baby Sounds for Pets by Kristen Overdurf-Abud – the album price was less than $12. Help your dog to get used to the baby’s scent – bring home a blanket or article of clothing. Allow the dog to smell the clothing. Carry the article of clothing/blanket around as you did the baby sounds. Put it in the crib, the pram etc. Your dog will no doubt be super excited to see mum. So have someone else bring baby in, and have mum ready to meet the mutts. Allow the dog to smell the baby – this may be a two person job. Try to sit on the couch and have the dog sniff (remember 4 feet on the floor). Have a second person with the dog and the dog on a loose lead with treats ready to redirect. If you are by yourself, set it up so that you have a baby gate and crouch down beside the gate with the dog on the other side. This is the equivalent of a baby crate – and will keep your bub safe during tummy time etc. Many parents feel safe that in the first few months babies are pretty limited in their movement. So if they have to duck to the kitchen or answer the door or pick up the phone, it is unlikely the baby will have made a great escape. However as much as this is the case, leaving your baby unattended even for a few seconds, could result in an injury, albeit accidental from your dog. Consider this: Baby is down for tummy time in the lounge room. Dog is sleeping soundly in his crate with the door open. The phone rings, so mum rushes to answer it – just in the kitchen a few meters away. The doorbell rings – dog jumps up and races across the lounge room (over baby) to bark at the door. Poor baby has just got trampled by your dog. If this is the case, hopefully by a Chihuahua and not a Great Dane. Does your dog show any resource guarding tendency? Has your dog ever, growled, frozen, raised a lip, stared at you, scoffed the food when you have approached a bone, toy or bowl? If so your dog is a resource guarder and is a risk to your baby – set your dog up for success and only give access to these things in a safe and secure area – crates work well. Start prepping your dog/s and helping them with this problem, by walking by when they have something of value, and dropping something of greater value for them. If your dog has a generalised resource guarding tendency – including toys, doorways, beds etc, please seek the help of a veterinary behaviourist or positive reinforcement trainer immediately. Water bowls and the risk of infant drowning. Babies can drown in just a few cm of water. Some things you can do to help prevent this is use an elevated water bowl, remove clam shell swimming pools, use a water bowl designed to slow dogs drinking, or even a flat shallow dish. And last but not least, use some techniques that may help to reduce stress for your dog. This has been scientifically proven to not only help puppies but also dogs of all ages with many things including the introduction of a new baby. I would recommend an ADAPTIL collar, a month prior to baby’s due date and for a few months minimum after. Classical music, that is scientifically proven to reduce stress in dogs (people as well). Make sure your dog has got plenty of things to do. Use food dispensing toys, play games (that involve you where possible), take for sniff walks where your dog is allowed to stop and smell the lamp post etc. I hope this helps you and your dog/s adjust to life with the new baby. Adaptil.com, (n.d.). Adaptil helps dogs and puppies learn settle travel and in kennels. [online] Available at: http://www.adaptil.com/au [Accessed 23 May 2015]. Anon, (n.d.). [online] Available at: https://www.daf.qld.gov.au/__data/assets/pdf_file/0005/68252/Dogs-in-Utes.pdf [Accessed 23 May 2015]. Beaver, B. (2009). Canine behavior. Philadelphia, Pa.: Saunders. Dube, M. and Zulch, H. (2012). Stress and Pheromonatherapy in Small Animal Clinical Behaviour. Wiley-Blackwell. Kirkham, L. (2012). Tell your dog you're pregnant. Melbourne, Australia: Little Creatures Pub. Pelar, C. (2005). Living with kids and dogs-- without losing your mind. Woodbridge, VA: C & R Publishing. Silvani, P. and Eckhardt, L. (2005). Raising puppies & kids together. Neptune City, NJ: TFH Publications. Throughadogsear.com, (2015). 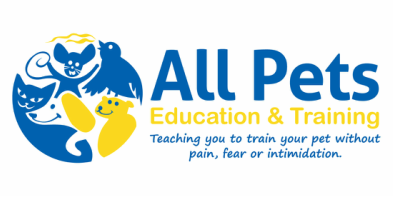 Through a Dog's Ear - Music Therapy for the Prevention and Treatment of Canine Anxiety!. [online] Available at: http://throughadogsear.com/ [Accessed 23 May 2015].